Hello! I hope you’re having a fantastic day. 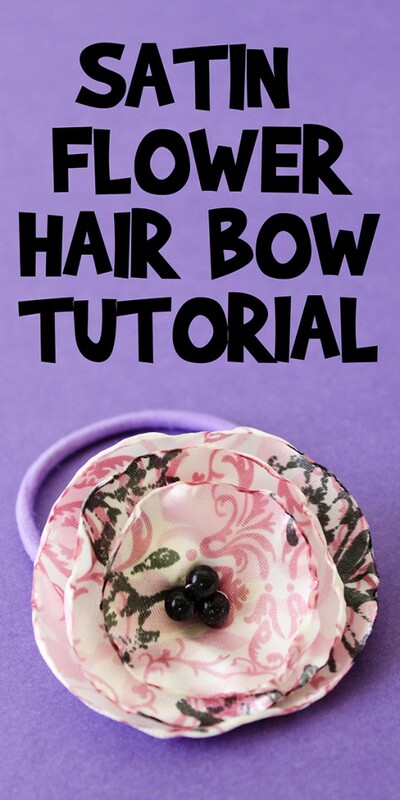 Today I’m sharing how to make this Satin Flower Hair Bow. 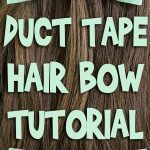 It’s way easier than it looks, and you just need to know a few basic sewing skills such as how to thread a needle, make stitches, and make a knot. We’ll also be working with fire, so this is a project for responsible older kids and teenagers with adult supervision. Satin fabric. This needs to be a polyester satin fabric, not a cotton. You can use a light inexpensive satin or a thicker satin, both will work as long as it’s polyester. Needle and thread. 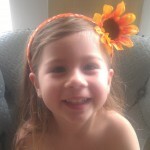 You could also do this entirely with hot glue if using a headband or hair clip. Hair tie. 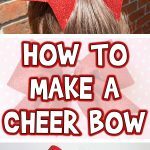 You can also use a headband or a hair clip to attach the bow to. Tea light and lighter. I like using a small tea light for projects involving fire, because it produces a small steady flame and is safer than just using a lighter. Please be near a source of water or a fire extinguisher and have adult supervision while working with fire. Beads. For the center of the flower. Pen, pencil, or fabric chalk. To make circles on the fabric. Something to make circles with. 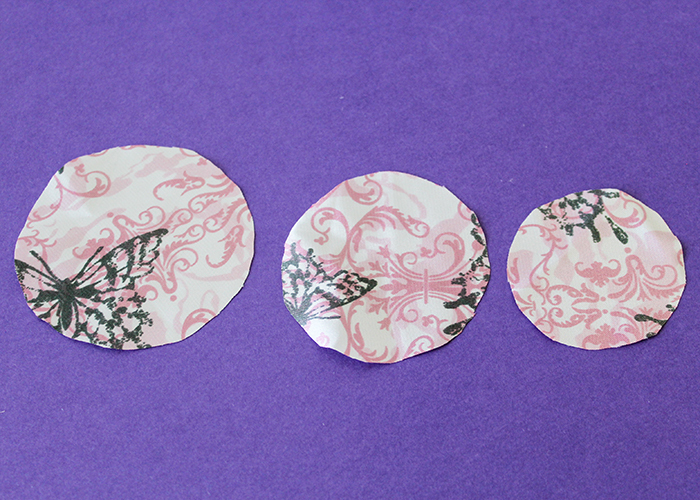 You need to make three (or more) circles that are each about a centimeter smaller than each other. You can use a stencil, a compass, free hand draw them, or I used three different makeup containers. 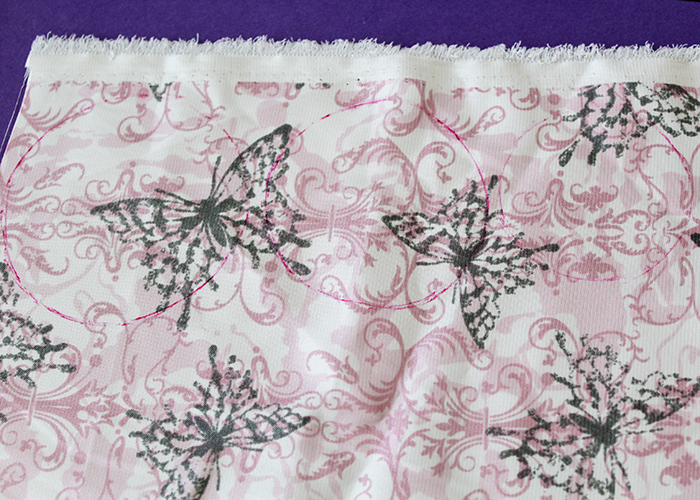 Start by taking your fabric and flipping it over to the back side. I placed the three round containers down close to each other. Then I used a pen to draw my circles, but you can use whatever you’d like. Just trim slightly inside of the marks when you cut out the circles. Each circle is a slightly different size. You can make as many as you want. The more you make, the fuller your flower will be, though I wouldn’t do more than five or six. 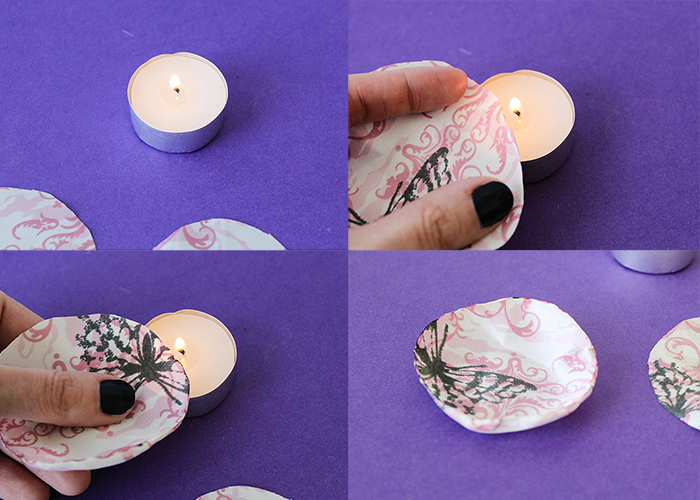 Light your tea light. Now you’re going to take one satin circle and hold the edge near the flame, rotating slowly. You’ll notice the edge starts to melt and slightly curl. Keep rotating the circle until the entire edge is lightly melted and curling up. 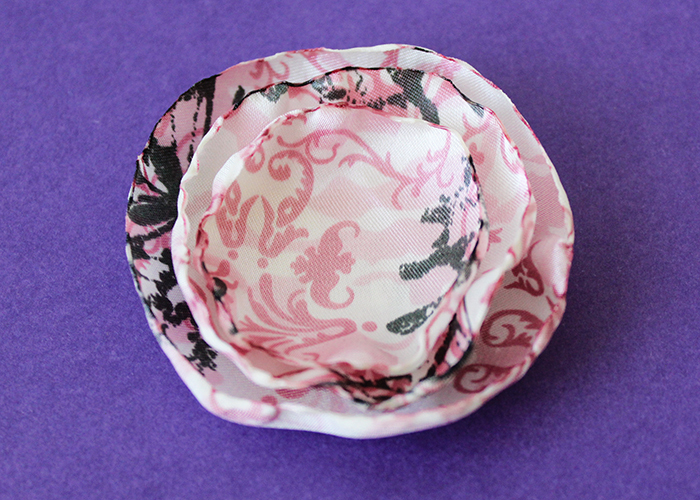 This finishes the edges so they don’t fray, and causes the circle to curl up and form a round petal. Do this with all of your circles. 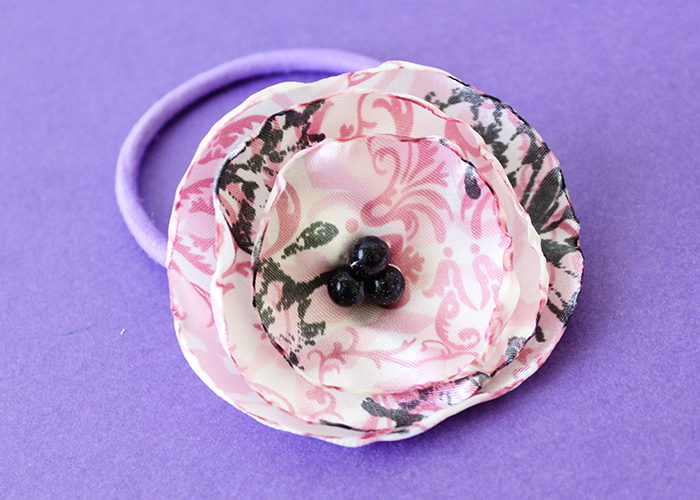 Some will curl in different ways, and this makes for a more organic natural look to the finished flower. Stack the petals on top of each other, with the smallest one on top. 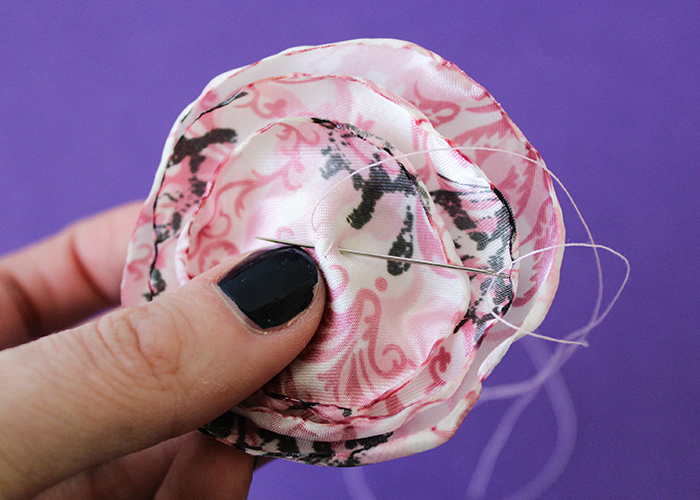 Take your needle and thread, and make a few stitches in the center to hold the layers of petals together. 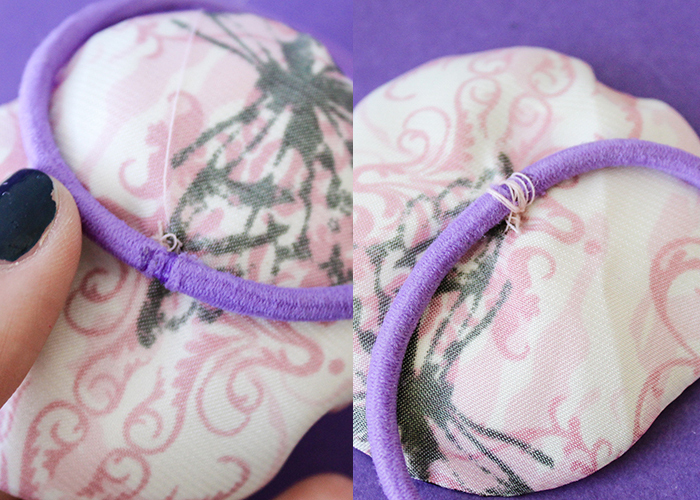 Next we’re going to sew our beads in the center. 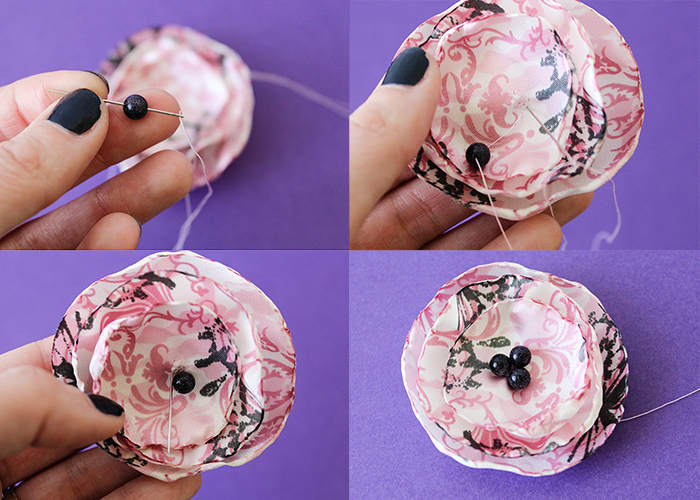 Bring your needle to the front of the center of your flower, and string a bead on it. Go back down through the center, and back up to string on the next. 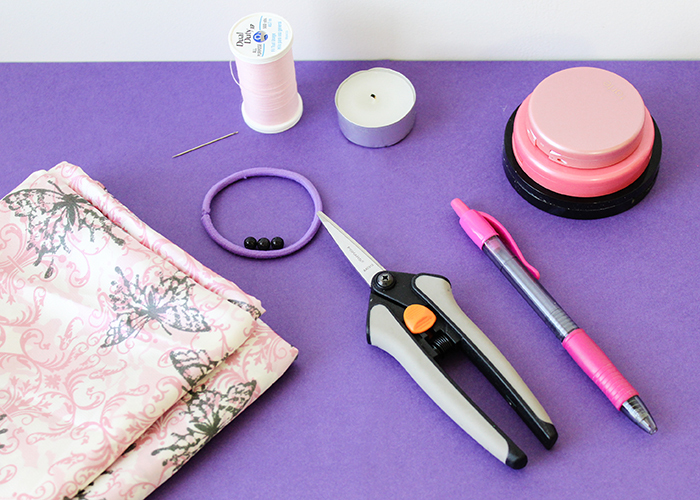 If sewing isn’t your thing and this step seems a bit complicated, you can easily glue the beads down with hot glue or a crafting glue instead. 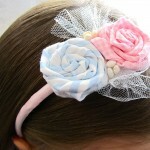 Then just stitch an elastic hair band to the back of the flower. 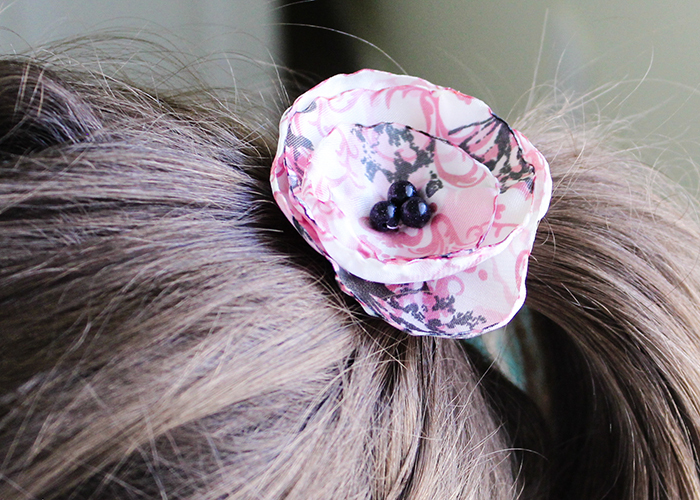 If you don’t want to sew, you can also hot or craft glue it down to a headband or a hair clip. And you’re done! 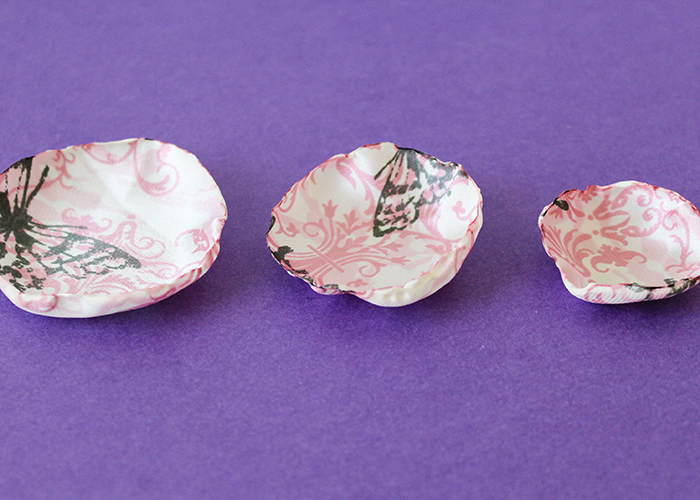 You can make a bunch of these fairly quickly, and the make great hand made gifts. 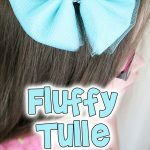 Plus, you can easily make them to match a variety of outfits. I think they’re so cute! 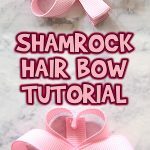 Have fun making your satin flower hair bow!